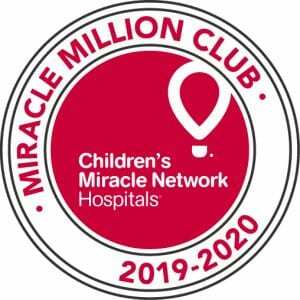 The Miracle Million Club is a special group of corporate and media partners, Dance Marathon schools, and Extra Life supporters who individually raise more than $1 million for local children’s hospitals on an annual basis. Join us in celebrating the newest 2019-2020 Miracle Million Club members! Walmart and Sam’s Club: Walmart and Sam’s Club associates work hard to raise funds during their campaign, which will be June 10 – July 7, 2019. In additional the the millions raised during the campaign they have started off 2019 already raising more than a million dollars through creative non campaign fundraising to give all of our hospitals those extra dollars to help kids live better. Coca-Cola: 2018 was a milestone year for our 30-year partnership with The Coca-Cola Company, delivering over one million dollars in annual fundraising. The Coca-Cola system has shown an unshakeable commitment to this important cause and the kids we serve. Coca-Cola’s contributions to CMN Hospitals in 2018 spanned a diverse array of local and national fundraising and awareness programs. These include numerous in-store retail programs, a generous grant from The Coca-Cola Foundation, rewards donations through the Coca-Cola Give platform, Dance Marathon support, various national and regional holiday campaigns, and more. Coca-Cola has truly made a difference for over 10 million kids treated at our 170 children’s hospitals. Ace Hardware: Since becoming a Children’s Miracle Network Hospitals partner in 1991, Ace Hardware has raised more than $100 million for local Children’s Miracle Network Hospitals across the country. This success stems from the creative fundraising efforts of the Ace Hardware Foundation and the generous contributions of Ace retailers, customers, vendor partners and team members. Participating Ace retailers support their local Children’s Miracle Network Hospital each year through many national programs including Round Up For Kids, Ace Bucket Days, the World’s Finest Chocolate Candy Program and more to raise funds locally. In addition, many Ace Retailers and Ace Retail Support Centers host regional fundraising events each year ranging from 5K’s to golf outings to barbecue events, and employee sales. BuckeyeThon: BuckeyeThon at The Ohio State University had another record-breaking year fundraising a total $1,704,184.19 For The Kids at Nationwide Children’s in Columbus, OH. BuckeyeThon has done an incredible job this last year engaging their campus and educating them on fundraising best practices. Children’s Miracle Network Hospitals is once again excited to welcome BuckeyeThon to the Miracle Million Club! UGA Miracle: UGA Miracle hosted their annual 24-hour Dance Marathon event at the University of Georgia on Saturday, February 23 – Sunday, February 24. UGA Miracle raises funds for Children’s Healthcare of Atlanta, and has been a part of the Miracle Network Dance Marathon movement since 1995. UIDM: In their 25th year, the University of Iowa Dance Marathon shaped their impact in incredible ways. Their silver anniversary year brought with it new ideas, a deepened focus on diversity and inclusivity, and more miracles than you can count. With the implementation of their first ever year-round campaign- Shape Your Impact, their commitment to funding $2.2 million dollars to endow a Child Life Specialist position for the UIDM Pediatric Cancer Center, and so much more, the University of Iowa Dance Marathon continue to set the standard and lead the way for Dance Marathon programs across the nation. Raising $2,960,403.25 in their 25th year, the UIDM students kept their unwavering dedication to supporting pediatric oncology and bone marrow transplant patients and their families at the forefront. We cannot wait to see what things that the University of Iowa Dance Marathon continues to do in the future. HuskyTHON: This year, University of Connecticut’s HuskyTHON celebrated their 20th anniversary with Children’s Miracle Network Hospital’s. On this memorable year, we welcome HuskyTHON again into the Miracle Million Club! In 2019, their campus came together to Raise Them Up, and that’s exactly what they did. Congratulations to HuskyTHON for raising $1,328,402.19 for the kids treated at Connecticut Children’s Medical Center. Over HuskyTHON’s 20 years, they have collectively raised more than $6million for the patients and families in their community. Join us in welcoming HuskyTHON into the Million Miracle Club again. 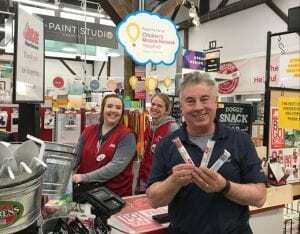 Casey’s General Stores: Congratulations to Casey’s General Stores for completing their 6th annual fundraising campaign with a record-breaking increase in funds raised for Children’s Miracle Network Hospitals. In their 2019 campaign, Casey’s asked their customers to round up their change to the nearest dollar, donating the difference to the local hospital in their community. Funds raised by Casey’s help kids just like Sam, from Iowa. Sam, or #SuperSam as many have come to know him, was diagnosed with a cancerous brain tumor one week before his 4th birthday in March 2017. When the tumor was discovered, he had neurosurgery to remove 100% of the tumor. He also received 30 rounds of Proton Beam Radiation. Sam harvested his own stem cells to be later used during chemotherapy. He finally came home upon completion of treatment in October 2017. Although he is all finished with active treatments, he still makes trips to Iowa City every three months for MRIs and blood testing. His last MRI showed clear scans and he is enjoying life everyday as a healthy little 5-year-old boy. He started school last fall and enjoys pepperoni pizza from his local Casey’s!